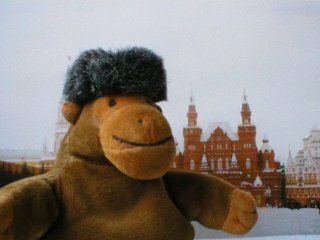 "It's not toasty warm here, you know"
Whether he's wandering through the mighty forests or making one last contact in Red Square, Mr Monkey wears his ushanka whenever he visits Mother Russia. 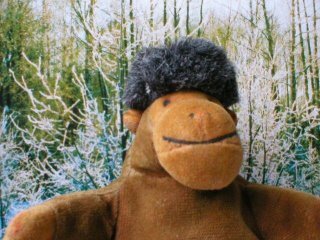 Mr Monkey's ushanka has a felt base, with the furry bits taken from a very unconvincing toy badger. Unfortunately the ear flaps don't flap down properly.